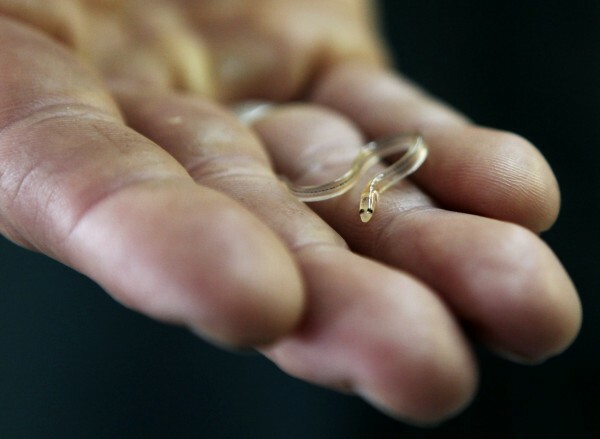 Paul Firminger holds an elver in his hand at South Shore Trading Co., an elver buying station, in Portland, in May 2012. ELLSWORTH, Maine — Maine’s Department of Marine Resources has released updated 2012 landings figures that confirm what many people already knew, if only unofficially: the value of the state’s elver fishery shot up significantly last year. The official preliminary tally of last year’s elver season, which ran from late March through the end of May, indicates that elver fishermen earned a cumulative total of nearly $38 million in 2012, which is approximately five times the cumulative total of $7.6 million that they got for their catch the year before. Compared to 2010, it’s even more staggering. That year, the fishery generated only $584,000 in revenue for licensed fishermen — one sixty-fifth of its value in 2012. The elver fishery now ranks behind only lobster in Maine for overall fishery value. Updated lobster landings figures also released on Thursday indicate more than 126 million pounds of lobster were caught in Maine last year, earning lobster fishermen a cumulative total of nearly $339 million for their catch, both of which are record figures. Due to tumult in the lobster market, however, the average price lobster fishermen earned for their catch last year was $2.69 per pound, the lowest annual price they have received since 1994. Overall, according to DMR, Maine commercial fishermen caught 314,989,031 pounds of marine species in 2012, for which they cumulatively were paid more than $521 million. The price spike for elvers has been attributed to demand in the Far East, where a massive tsunami in March 2011 wiped out stockpiles of eels that were being cultivated in Japanese aquaculture ponds for the region’s seafood markets. After averaging $185 per pound for their catch in 2010, elver fishermen in Maine averaged just under $2,000 per pound for the entire 10-week season last year. Maine is one of only two states, the other being South Carolina, where fishing for the juvenile American eels is allowed. DMR issues only 407 elver licenses each year, which would suggest that the average elver income for each of those licensed fishermen in 2012 was more than $93,000. The Passamaquoddy Tribe issued 236 other elver licenses to its members in early May last year, which surprised state officials, but it is not clear how many of those licenses actually were put to use before the season ended on May 31. DMR officials predicted last fall that the value of the fishery would be close to $40 million but did not release estimated landings totals for the fishery until Thursday. The volume of landings in the fishery also increased significantly from 2011 to 2012. According to DMR statistics, elver fishermen caught more than 19,000 pounds of elvers last year after having caught 8,500 pounds in 2011. In 2010, only 3,100 pounds of elvers were caught in Maine. The higher catch last year is of note because American eels are being considered by U.S. Fish and Wildlife Service for possible listing as a protected species under the federal Endangered Species Act.